This paper describes spawning events of the white bream Blicca bjoerkna (Linnaeus, 1758 )in astronomical and biological time depending on seasonal patterns of climatic conditions. The research was conducted in the "Dnipro-Orilskiy" Nature Reserve (Ukraine) during the years 1997–2015 in four habitat types. The timing of the spawning event (start, end) was evaluated using astronomical time (number of days from January 1 each year), with correction for the lunar and the semilunar cycle, and using biological time (number of days from the end of spawning in the previous year to the beginning and end of spawning in the current year). The spawning phenology of the white bream was found to be dependent on the dynamics of weather conditions over time. Patterns of varying climatic regimes which are expressed by means of multivariate principal component are the most informative predictors of the spawning events. Evaluation of occurrence of spawning events in astronomic or biological time gives somewhat different models of the impact of climate regimes. The impact of the principal components indicating variability of rainfall during the year in which spawning occurs is statistically significant for almost all regression models. Models using the solar calendar are also more sensitive to the course of air temperatures within the year when spawning occurred. Correction of time based on the lunar cycle allows us to assess events which are sensitive also to the temperature and rainfall variation during the second half of the previous year. Biological time was shown to be sensitive to environmental influences over time from the end of spawning in the previous year to spawning in any given year. 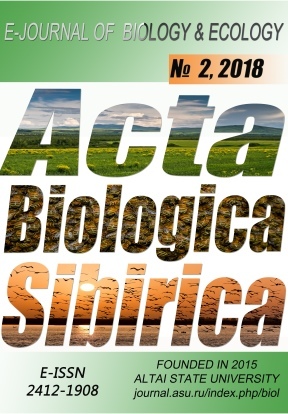 Acta Biologica Sibirica is a golden publisher, as we allow self-archiving, but most importantly we are fully transparent about your rights. Authors may present and discuss their findings ahead of publication: at biological or scientific conferences, on preprint servers, in public databases, and in blogs, wikis, tweets, and other informal communication channels. ABS allows authors to deposit manuscripts (currently under review or those for intended submission to ABS) in non-commercial, pre-print servers such as ArXiv. Arsan, O.M., Davydov, O.A. & D'yachenko, T.M. (2006). Methods of hydroecological researches of surface water. Logos, Kiev (in Ukranian with English summary). Baker, J.R. (1938). The evolution of breeding seasons. In: de Beer G.R. (ed), Evolution: Essays on Aspects of Evolutionary Biology. Clarendon Press, Oxford, UK: 161–177. Beklemishev, V.N. (1928). Organism and Community (To the Problem of Individuality in Biocoenology). Tr. Biol. nauch-.issled. in-ta i Biol. st. pri Permskom univ. 1(2–3), 12–14 (in Russian). Beklioglu, M., Meerfhoff, M., Søndergaard, M. & Jeppesen, E. (2011). Eutrophication and restoration of shallow lakes from a cold temperate to a warm mediterranean and a (sub) tropical climate. In: A.A. Ansari, G.R. Lanza, S.S. Gill & W. Rast (eds), Eutrophication: Causes, Consequences and Control. Springer, New York, 91–108. Berg, L.S. (1949). Fishes of fresh waters of the USSR and adjacent countries. Part 2. Izdatel′stvo Akademii Nauk SSSR, Moscow–Leningrad (in Russian). Billard, R., Breton, B., Fostier, A., Jalabert, B. & Weil, C. (1978) Endocrine control of the teleos reproductive cycle and its relation to external factors: salmonid and cyprinid models. In: P. J. Gaillard, H. H. Boer (eds), Comparative Endocrinology. Elsevier/North Holland Biomedical Press, Amsterdam, 37–47. Blenckner, T. (2001). Climate Related Impacts on a Lake. From Physics to Biology. Acta Universitatis Upsaliensis. Comprehensive Summaries of Uppsala Dissertations from the Faculty of Science and Technology, 674, 37. Bondaryev, D. L. (2007). The structure of the spawning populations of bream (Abramis brama) of the Dnieper-Oril Nature Reserve. Visnyk Dnipropetrovs'koho universytetu. Biolohiya. Ekolohiya, 15(1), 9–14 (in Russian with English summary). Bradshaw, W.E. & Holzapfel, C.M. (2007). Evolution of animal photoperiodism. Annu. Rev. Ecol. Evol. Syst., 38, 1–25. doi:10.1146/annurev.ecolsys.37.091305. Brett, J.R. (1979). Environmental factors and growth. In: Hoar W.S., Randall D.J. & Brett J.R. (eds.) Fish physiology. Vol. 8. Bioenergetics and growth. Academic Press, NewYork, NY, USA: 599–675. Chugunova, I. I. (1952). Methods of studying the age and growth of fish. AN SSSR, Moscow (in Russian). Collingsworth, P. D. & Marschall, E. A. (2011). Identifying relationships between catches of spawning condition yellow perch and environmental variables in the western basin of Lake Erie. Trans. Am. Fish. Soc. 140, 31–36. Crozier, L. G. & Hutchings, J. A. (2014). Plastic and evolutionary responses to climate change in fish. Evolutionary Applications, 7, 68–87. Domagała, J., Dziewulska, K., Kirczuk, L. & Pilecka-Rapacz, M. (2015). Sexual cycle of white bream, Blicca bjoerkna (Actinopterygii, Cypriniformes, Cyprinidae), from three sites of the lower Oder River (NW Poland) differing in temperature regimes. Acta Ichthyol. Piscat., 45 (3), 285–298. Edwards, M. & Richardson, A.J. (2004). Impact of climate change on marine pelagic phenology and trophic mismatch. Nature, 430, 881–884. Fischer, J. H., Freake, M. J., Borland, S. C. & Phillips, J. B. (2001). Evidence for the use of magnetic map information by an amphibian. Animal Behaviour, 62, 1–10. Foster, R.G. & Kreitzman, L. (2009). Seasons of life: the biological rhythms that enable living things to thrive and survive. Yale University Press, New Haven, CT.
Grant, R. A., Chadwick, E. A. & Halliday, T. (2009). The lunar cycle: a cue for amphibian reproductive phenology? Animal Behaviour, 78 (2), 349–357. Herzig, A. & Winkler, H. (1986). The influence of temperature on the embryonic development of three cyprinid fishes, Abramis brama, Chalcalburnus chalcoides mento and Vimba vimba. Journal of Fish Biology, 28 (2), 171–181. Hokanson, K. E. F. (1977) Temperature requirements of some percids and adaptations to seasonal temperature cycle. J. Fish. Res. Board Can., 34, 1524–1550. Jafri, S.I.H. (1989). The effects of photoperiod and temperature manipulation on reproduction in the roach Rutilus rutilus (L.) (Teleostei). Pakistan Journal of Zoology, 21 (4), 289–299. Jha, M.K., Gassman, P.W. & Panagopoulos, Y. (2015). Regional changes in nitrate loadings in the Upper Mississippi River Basin under predicted mid-century climate. Reg. Environ. Chang., 15, 449–460. Kanno, Y., Letcher, B.H., Hitt ,N.P., Boughton, D.A., Wofford, J.E.B. & Zipkin, E.F. (2015). Seasonal weather patterns drive population vital rates and persistence in a stream fish. Glob. Chang. Biol., 21, 1856–1870. Koblitskaya, A. F. (1963). Study of the spawning of freshwater fish. Pishevaya promishlenost, Moscow (in Russian). Koli, L. (1990). Fishes of Finland. Werner Söderström Osakeyhtiö, Helsinki (In Finnish). Kompowski, A. & Neja, Z. (1999). The Międzyodrze ichthyofauna as caught by various gear. Baltic Coastal Zone, 3, 103–112. Kopiejewska, W. (1996). Germ line of white bream, Blicca bjoerkna (L.) females in Włocławek Reservoir. Acta Ichthyologica et Piscatoria, 26 (2), 35–47. Kopiejewska, W. & Kozłowski, J. (2007). Development structure of ovaries in female white bream, Abramis bjoerkna from Lake Kortowskie in north-eastern Poland. Folia Zoologica, 56 (1), 90–96. Kottelat, M. & Freyhof, J. (2007). Handbook of European Freshwater Fishes. Cornol (Switzerland) and Berlin (Germany). Published by the authors. Kryizhanovskiy, S. G. (1949). Ecological and morphological patterns of development cirque, loaches and catfish fish. Tr.in-ta morfologii zhivotnyih AN SSSR, 1, 5–332 (in Russian). Lohmann, K. J. & Willows, A. O. D. (1987). Lunar-modulated geomagnetic orientation by a marine mollusk. Science, 235, 331–334. Organisms. Collection of Papers. Nauka, Moscow (in Russian). Mann, R.H.K., Mills, C.A. & Crisp, D.T. (1984). Geographical variation in the life–history tactics of some species of fresh–water fish. In: Potts G.W., Wootton R.J. (eds.) Fish reproduction: Strategies and tactics. Academic Press, London, UK, 171–186. Mbungu, W., Ntegeka, V., Kahimba, F.C., Taye, M. & Willems, P. (2012). Temporal and spatial variations in hydro-climatic extremes in the Lake Victoria basin. Phys. Chem. Earth, 50–52, 24–33. McCarty, J. (2001). Ecological consequences of recent climate change. Conserv Biol., 15, 320–331. McDowall, R.M. (1969). Lunar Rhythms in Aquatic Animals A General Review. Tuatara, 17 (3), 133–143. Mohseni, O. & Stefan H.G. (1999). Stream temperature/air temperature relationship: a physical interpretation. J. Hydrol., 218, 128–141. NCADAC (2013). National climate assessment and development advisory committee. Third national climate assessment draft report: U.S. global change research program. Available from: http://www.globalchange.gov/publications/reports (accessed on Dec 2017). Nikolskiy, G. V. (1974). Fish ecology. Vyisshaya shkola, Moscow (in Russian). Noges, P. & Jarvet, A. (2005). Climate driven changes in the spawning of roach (Rutilus rutilus (L.)) and bream (Abramis brama (L.)) in the Estonian part of the Narva River basin. Boreal Environment Research, 10 (1), 45−55. Ouarda, T.B.M.J., Charron, C., Kumar, K.N., Marpu, P.R., Ghedira, H., Molini, A., Kayal, I. (2014). Evolution of the rainfall regime in the United Arab Emirates. J. Hydrol., 514, 258–270. Pankhurst, N. W. & Munday, Ph. L. (2011). Effects of climate change on fish reproduction and early life history stages. Marine and Freshwater Research, 62, 1015–1026. Pervukhin, M.A. (1979). Genetic classification of floodplain lakes. Moscow State University Press, Moscow (in Russian). Phillips, J. B. (1986). Magnetic compass orientation in the eastern red-spotted newt (Notophthalmus viridescens). Journal of Comparative Physiology, A (158), 103–109. Pravdin, I. F. (1966). Guide to the study of fish. Pischevaya prom-t, Moscow (in Russian). Schneider, K. N., Newman, R. M., Card, V., Weisberg, S. & Pereira, D. L. (2010). Timing of walleye spawning as an indicator of climate change. Transactions of the American Fisheries Society, 139, 1198–1210. Sharamok, T., Ananieva, T. & Fedonenko, O. (2017). Environmental status of Kam’yanske reservoir (Ukraine). Ekológia (Bratislava), 36(3), 281–289. Slastenenko, E. (1956). The Fishes of the Black Sea Basin. The General Directorate of Meat and Fish Publications (in Turkish). Spivak, E.G. (1987). Reproduction of the white bream Blicca bjoerkna (L.) in Kahovsk Reservoir bays. Voprosy Ihtiologii, 27(1), 101–105 (in Russian). Spratte, S. & Hartmann, U. (1997). Fischartenkataster: Suswasserfische und Neunaugen in Schleswig–Holstein. Ministerium für landliche Raume, Landwirtschaft, Ernahrung und Tourismus, Kiel, Germany. Stefan, H.G. & Preud’homme, E.B. (1993). Stream temperature estimation from air temperature. Water Resour Bull., 29, 27–45. Tadajewska, M. (2000). White bream (Blicca bjoerkna L.). In: Brylińska M. (ed.) Freshwater fish of Poland. PN, Warszawa, 249–257 (In Polish). Thompson, A. L. (1950). Factors determining the breeding seasons of birds: an introductory review. Ibis, 92, 173–184. Vernadsky, V. I. (1923). A plea for the establishment of a biogeochemical laboratory. The Marine Biol. Stat. of Part Erin Annual Report, 37, 38–43. Vernadsky, V. I. (1926). The Biosphere. Nauchntekhn. izdatelstvo, Leningrad (in Russian). Wielgosz, S. & Tadajewska, M. (1988). Factors determining diet composition and food availability for bream Abramis brama (L.) and white bream Blicca bjoerkna (L.) in Włocławek Dam Reservoir. Acta Ichthyologica Et Piscatoria, 18(1), 79–100. Ye, L. & Grimm, N.B. (2013). Modelling potential impacts of climate change on water and nitrate export from a midsized, semiarid watershed in the US Southwest. Clim. Chang. 120, 419–431. Yılmaz, S., Yazıcıoğlu, O., Erbaşaran, M., Esen, S., Zengin, M. & Polat, N. (2012). Length-weight relationship and relative condition factor of white bream, Blicca bjoerkna (L., 1758), from Lake Ladik, Turkey. Journal of the Black Sea/Mediterranean Environment 18(3), 380–387. Yılmaz, S., Yazıcıoğlu, O., Yazıcı, R. & Polat, N. (2015). Age, growth and reproductive period of white bream, Blicca bjoerkna (L., 1758) in Lake Ladik, Turkey. Limnofish, 1(1), 9–18.